This Maheswari Cotton Silk Saree has elegant Off White body with attractive Red bottom border and black top border. Elegant Off white body of the saree with the multicolored border to deliver a unique fresh look. 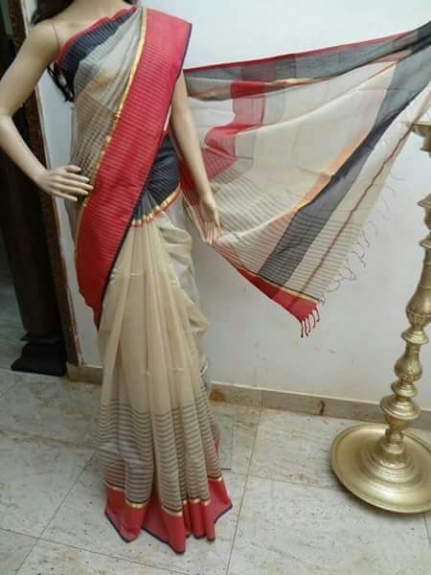 The multi-colored pallu has narrow horizontal strips in different shades of red and black along with golden zari border that runs along both ends of the pallu. The Natural Cotton and Silk fabric and pure vegetable colors add a unique luster to this traditional saree. This elegant Off White colored saree with beautiful contrasting and yet suiting Multi coloured borders along with a graceful pallu suits casual as well as office wear.